I think writing prompts are super helpful, so here’s a collection of holiday writing prompts (mostly Christmas, but some Hanukkah and more wintery-general themed) that you might use to spark some creativity. Use them for short stories, full-blown novels, free writing — whatever works for you. A family receives a gift from a far-away aunt for Hanukkah, but wake up the next morning to find a golem has formed from the packing materials. A man spends the afternoon building a snowman with hi son, but as he’s getting ready for bed that night he notices that snowman has moved at least 20 feet toward the house. While hiking in the woods, a man and his partner come across a reindeer that seems to desperately want to be followed. Two twin girls set out on Christmas Eve with a plan: to capture Santa Claus. A family decides to spend their winter holiday in their uncle’s cabin in the woods, but they wake up in the middle of the night to a visitor digging through the trash: an abominable snowman. A Christmas Tree that loses its star sets out on a mission to find it. Two elves decide to stow-away inside a Christmas package bound for a young boy in rural Pennsylvania. One night a man wakes to see a red glow outside his window. On further examination, he’s stunned to see that it’s a reindeer in his yard. A snowman wakes up to find out he’s on a truck, heading for a very warm climate. You find a music box that, when played, brings a sugarplum faerie to life. She’s not friendly. When a blizzard strands several people in an abandoned factory in Northern California, they find the factory’s workers — elves — never really left. It’s your first day on the job, as one of Santa’s elves. Slowly, a man comes to the realization that his world and everything he knows is just the inside of a snow globe. A boy pushes a snowball down a hill, and from there, it really takes on a life of its own. The crew of earth’s first deep-space ship celebrate Christmas together, until they receive a distress call from another ship apparently on its way to earth. A man with a collection of dreidels buys a new one from an antique shop on Second Avenue. But when he gives it its first spin, it doesn’t stop. It was the night before Christmas, and suddenly all the creatures were stirring. Driving through the country one night, you spot a lone Christmas tree trimmed and lit, but you have no idea who decorated it or where it’s getting its power. After bringing your newborn baby home from the hospital, you get a visit from three men who claim to have travelled a long way to see your child. Oh, and they have gifts. In a chest you’ve inherited from your mother, you find a copy of a family tree you’ve never seen before that seems to indicate you’re a direct descendant of Ebenezer Scrooge. As always, these are creative commons licensed. And if you’re looking for more, I’ve got some scifi writing prompts here and some fantasy writing prompts here. 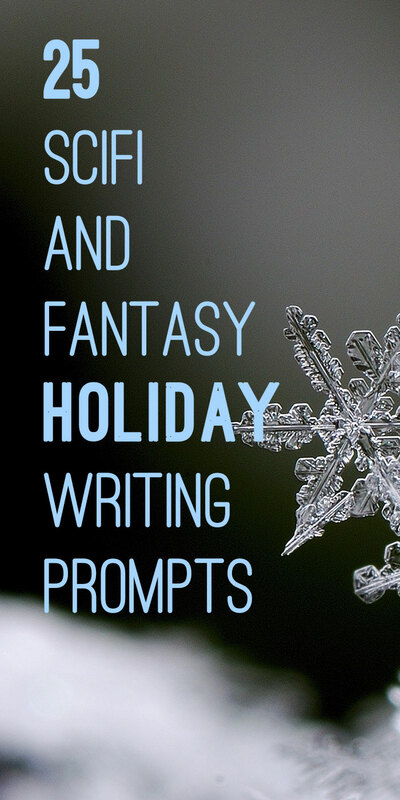 25 Scifi and Fantasy Holiday Writing Prompts by Justin McLachlan is licensed under a Creative Commons Attribution-ShareAlike 4.0 International License.